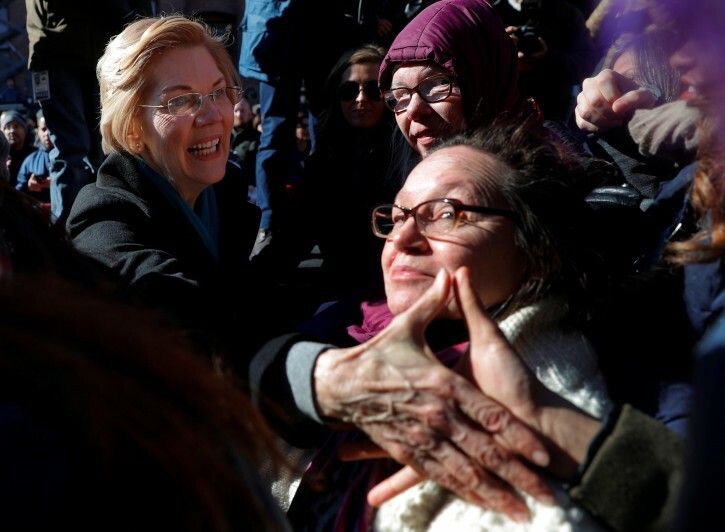 Supporters turned out in below-freezing temperatures, many hoisting signs — “Win With Warren,” one read. A Massachusetts bakery created “Persist” cookies for the event to honor the candidate’s slogan, “Nevertheless, She Persisted,” words first spoken in the Senate to rebuke her. 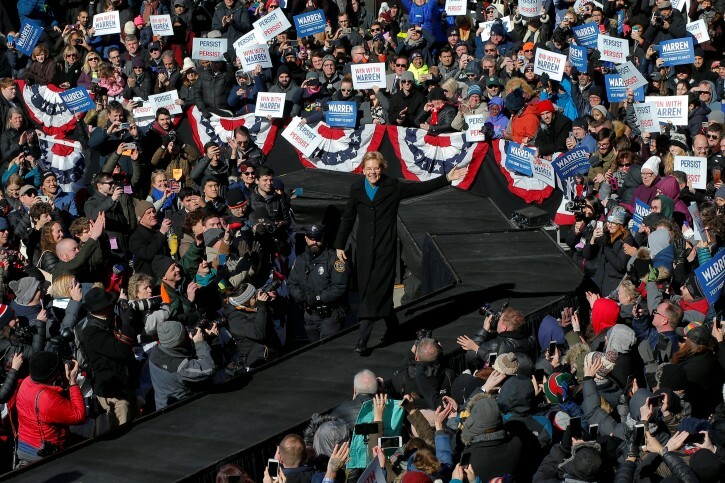 Warren’s rollout rally was a potent motivator for longtime supporters such as Mo Malekafzaly and Carlos Garcia, two longtime backers who attended her rally from Shrewsbury, Massachusetts. She will hold an event later Saturday in New Hampshire, home to the nation’s first primary, and plans to spend Sunday in Iowa, where the leadoff caucuses will be the first test of candidates’ viability. She was endorsed and introduced Saturday by Massachusetts Democrats Sen. Ed Markey and Rep. Joe Kennedy III. Kennedy’s backing could prove valuable for Warren, given his status as a rising young Democratic star and his friendship with one of her potential 2020 rivals, former Rep. Beto O’Rourke, D-Texas. Another threat could come from a fellow senator who has yet to announce his own plans for 2020: Sanders. They’re both leaders of the Democrats’ liberal vanguard, but some Sanders supporters are still upset Warren didn’t support him during his 2016 primary run against Hillary Clinton. 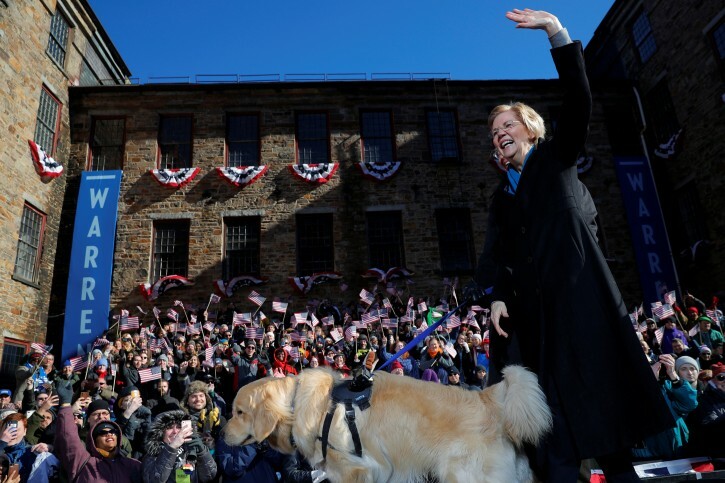 And as a senator from Vermont who won the New Hampshire primary, he would likely go into the Granite State as an early favorite if he decided to run again. What an idiot that Pocahontas is, like thinking that her DNA test would score points. A snowball has a better chance in hell than she does for being the Dem candidate. Waste of her money, time and energy. Trump will make chopped liver out of her. Mock chopped liver. She’s a radical leftist. She will not get the nomination. Make my word. Trump would love to run against Pocahontas he’ll crush her! I think Hashomer has a better chance of winning than she does. It's great that she's runing for POTUS, our current POTUS will make chopped meat out of her. She's ado NOTHING yenta, at best. The only credentials this ugly fool has is she's anti Trump. She's a joke !